NFL UK have today confirmed Def Leppard will perform a pregame show at Wembley Stadium on 28th September before the Oakland Raiders/Miami Dolphins game. The Oakland Raiders will play the Miami Dolphins at Wembley Stadium on Sunday 28th September. Kick off is at 6pm. The appearance was confirmed earlier by NFL UK with quotes by Joe below. See link for a short video recently recorded by the band at the 6th August Wantagh, NY backstage Meet And Greet area. This was hinted at last night on twitter. Def Leppard have only played Wembley Stadium once before at the April 1992 Freddie Mercury Tribute show. The stadium has since been rebuilt and was reopened in 2007. As mentioned the band appeared in the opening titles of the US NFL show Monday Night Football in October 1993 to promote the Retro-Active album. This will be the band's first UK appearance since 14th December 2011 at Wembley Arena. The final show of the Mirrorball world tour. Rock legends Def Leppard will perform the pre-game show at the first of this year’s three NFL International Series games on Sunday September 28, when the Oakland Raiders host the Miami Dolphins. 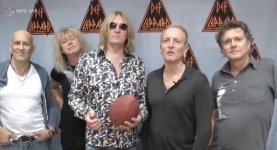 Def Leppard, who have sold 100 million albums worldwide in a career spanning three decades, will showcase some of their biggest hits before kickoff of the NFL's ninth regular-season game to be played in London since the International Series began in 2007. The band's lead singer, Joe Elliott, said: "Having most recently visited Wembley in May to watch Sheffield United in the FA Cup semi-final, I know what the atmosphere in the ground is like for 'our' football so I'm really looking forward to performing there before the NFL game and of course soaking up the excitement of the actual match. I can't wait!" "Having Def Leppard perform at Wembley is going to be very exciting and a lot of fun," said Alistair Kirkwood, Managing Director of NFLUK. "We know their performance will get Wembley pumping, have the fans on their feet and set the tone for a great game." The Raiders-Dolphins game will kick off at 6:00 p.m. UK time (1:00p.m. ET) and will be aired live in the UK on Channel 4 and Sky Sports and in the US on CBS. Phil - "Hi, we're Def Leppard and welcome to the new and improved NFLUK.com. " Joe - "Watch us rock Wembley Stadium before the international series game between the Miami Dolphins and the Oakland Raiders on Sunday September 28th."